Hawaii has some of the most ambitious climate change and green energy goals in the US, which, admittedly, is not saying too much. The average person in Hawaii is probably more environmentally conscious than the US average. Even the most self-interested citizen here cares about the cleanliness of their favorite beach or other recreational area, and that translates into a generally high level of sympathy for environmentalism. Two-thirds of the citizens of Hawaii are concerned about climate change, said one speaker at the conference. The climate change conference, entitled Ha O Ke Kai (The Breath of the Sea) was attended by 150 of the most ardent climate change advocates in the state. It was a small conference, a single day, one keynote speaker and three panel discussions. I was there because after putting forward a proposal to create a climate change commission at the county government level, as well as mandating green house gas reduction goals by the county departments – which was, incidentally, voted down by my fellow commissioners – I realized that I didn’t understand climate change policy at all, and thought I might learn at least a little bit at this conveniently timed climate change conference. The focus of the conference turned out to be on greening transportation – by improving public transportation and discouraging single occupant vehicles – and on mitigating the impacts of climate change, particularly sea-level rise. These are both high priorities for Hawaii as traffic in Honolulu is hellish and sea-level rise will have a high economic impact on the coastal hotels that are the foundation of our tourism industry. The blind spot was agriculture, which was only mentioned in passing a few times. Agriculture in Hawaii struggles to exist, but it is fundamentally important to any consideration of climate change, I would argue. Tourism and commuting are not essential to civilization. Eating is. If we can’t figure out how to de-carbonize agriculture nothing else that we build upon that foundation is going to work in the long-term. Agriculture and human civilization are essentially the same thing. Which made it difficult to go from the climate change conference to agricultural bank board meeting, where climate change is not mentioned and not considered because it is not mentioned. Only money matters there. The men in that board room are the biggest and brightest in American agribusiness, operating thousands of acres of corn, soybeans, sorghum, and wheat if they are from the Mid-West or if they are from the great agricultural valleys of California they grow thousands of acres of tomatoes, onions, lettuce, artichokes or wine-grapes, almonds, walnuts, figs or dairies or feed yards with thousands of head of cattle. One of the farmers told me about how he is working on incorporating biochar into his business model so as to improve the soil health of his farmland in Kansas. On the other hand he showed me on his phone the land that he owned in Brazil which he had “improved” by clearing and planting in eucalyptus. It was not, I think, the actual Amazonian rainforest but close enough to make me queasy talking with him, queasy mostly in how it highlighted my own complicity, which most days I try not to look at too hard. So there’s the rub – the climate change advocates do not understand agriculture and the agri-businessmen do not understand climate change and what it may mean for all of us. It is as much a willful lack of understanding based on the current ideological/political fault-lines in the Anglo-phone nations at present (excepting, possibly, NZ) as it is any lack of information. If we lived in a rational world it should be the farmers and ranchers who are the biggest advocates for climate change action because we have the MOST to lose in the extreme weather that is predicted to be coming our way. I don’t know how we bridge the fault-lines. All I know is that it gave me whiplash to have lived in two such disparate paradigms within a few days. We must be thinking along the same lines. How do we reconcile all the differing views make changes in lifestyle that make our community more sustainable? Not easy to reconcile all the differences. When I think about this I tend to arrive at the conclusion that more small local businesses versus large consolidated companies would probably be better able to adopt necessary changes for local populations to survive. How do we get more small local businesses? I tend to think that access to cheaper healthcare has something to do with the solution. I love your sharing. We have a lot to talk about. 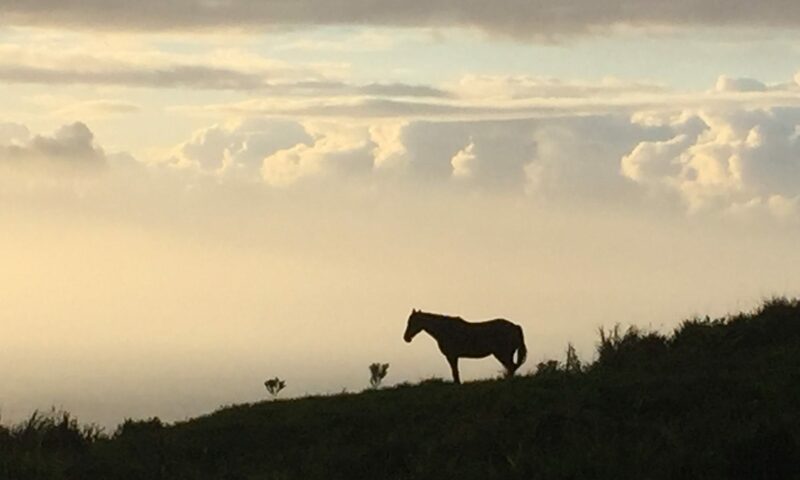 I have a small 460 acre ranch in Kohala and I help with Slow Food Movement (slowfood.com) we are starting to talk about establishing a strictly agricultural land trust for our island. We would love to have you part of the conversation. I also am a trustee of TRFF. .Org in the Pacific Northwest. Blaine Hoopai is my Ranch Manager and speaks highly of you. we met many years ago at a cattlemen meeting as I was interested in providing local beef for school lunches. 15 years later it is happening. First, even in the face of the difficulty it engenders, I heartily congratulate you on inhabiting both “worlds”. It will sound too simplistic to offer the advice of being patient as you straddle what seem such disparate social circles, but I think it does boil down to that. I also believe it would help more of us to take the challenging steps of participating in diverse human realms. This doesn’t bring answers more quickly – indeed it seems to make answers all the more difficult to attain as you note here. But ultimately it may make the answers we can find more robust and helpful. The human spirit and like it the human faculty for understanding nature are incredible. But nature is an incredibly complex thing. Because of humanity’s complex systems of communication, research and engineering we collectively have far more “power” to influence nature than any single person or even any small group can fathom. So mistakes are made. But is a mistake to one always a mistake to another? One man’s trash is another man’s treasure. Complexity is for me a great treasure. If everything were simple, I imagine we’d have already ruined everything and have long ago disappeared through our own folly. So complexity is a sort of gift; I like to treat it as such. When those around me suggest a simple solution to an obviously complex matter I tend toward caution. What can go wrong, and is the likelihood of a bad result more dangerous than what we face right now? Don’t make a bad situation worse. But I also don’t wish to fear any and all potential solutions because something might go sideways. Nothing ventured, nothing gained. My overall point is there can be very significant advantages to participation in disparate social environments. You don’t have to win a vote within a government council to have an impact. You don’t have to realign an investment portfolio today to influence how capital will be deployed in the future. You help by being present, by paying attention, by ruminating on all these matters, by carrying your piece of the load. Frustrations will come. They seem to be unavoidable. I doubt you’ve never fallen off a horse. And yet I imagine you’re a very accomplished rider. Did that happen overnight? Thanks for the pep talk and interesting ruminations, Clem! As the ongoing transition unfolds, we will see jarring juxtaposed worldviews, especially those of us trying to head in a sustainable direction, but of necessity having a foot in both worlds. I don’t have the personality or style to be a real vocal advocate, but do try to be a real world example, and engage all neighbors and viewpoints in as civil a tone as I can. Because of the strong tendency to stay in our tribal comfort zone, I think those like you who are engaged on both sides of this polarity will be the bridge. Within agriculture itself, there is a gap between the “traditional” farmers ( who define tradition as the way it’s been done for only the last 100 years of fossil fueled excess) and the (typically) younger, more sustainable minded ones who are trying to gain access to land and create a local, human scale food system. Let’s just hope that the pioneers and advocates can move things quickly enough to minimize a Seneca Cliff in our food systems.